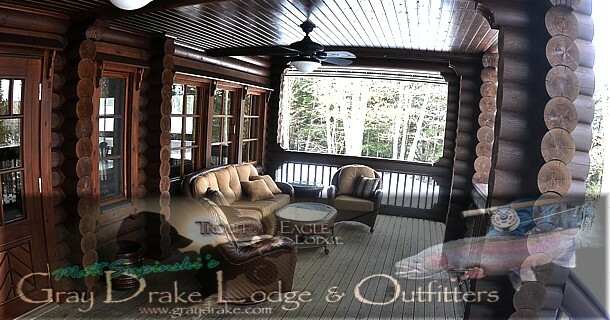 Thanks for checking out the new Blog for the Trout and Eagle Lodge in Newaygo Michigan. We are glad you stopped by, be sure to have a look around and if you have any questions please give us a call. From the moment you open the front doors and step inside, you instantly feel like you're home.Just in time for Salmon and Trout season, this luxurious three story Finland built Honka log lodge is located on one of the Muskegon River's most scenic bluffs and just a stone's throw from the Gray Drake It's plush forest setting is perfect for small groups, Corporate outings, meetings, and culinary gourmet weekends. 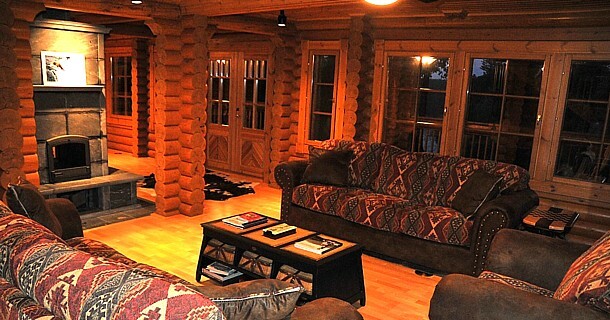 Furnished with the unique Rocky Mountain Montana decor and art work. This gorgeous 5,000 square foot structure can sleep up to 14 guests at one time. 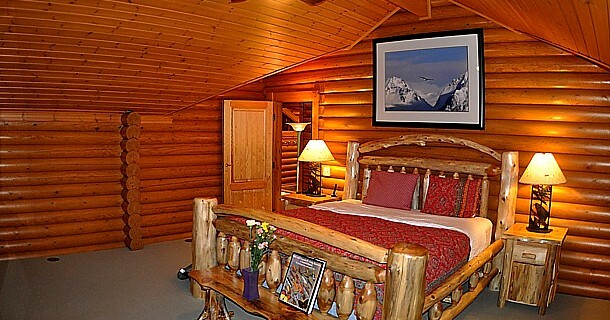 It has 2 king size log bedroom suites, in addition to multiple log bedroom sleeping quarters. In addition to all the other fine ammenities, we offer a state of the art gourmet appliance kitchen, large dinning area and comfortable leather couch lounge area with large HD plasma satellite visuals. All that and more makes this an ideal plush getaway for anyone. The view from the two decks overlooking the river, adorned with beautiful Adirondack wooden rocking chairs, is spectacular! 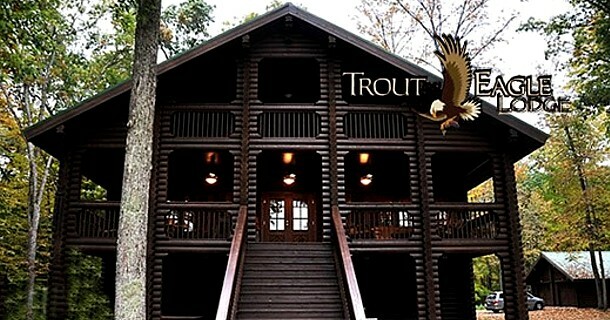 You will peer down with an eagle's view of the Muskegon's prime Trout, Salmon and Steelhead waters. So contact us today and Book your trip of a lifetime! 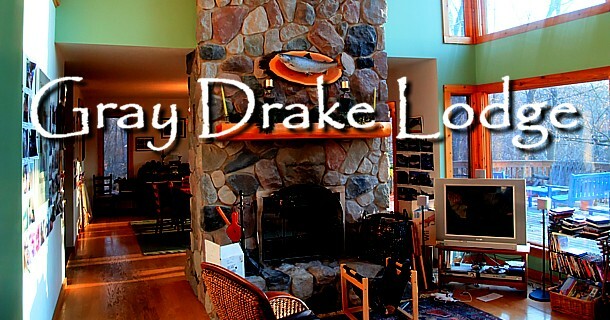 The fireplace in the Drake will warm your spirits after a long day on the water. 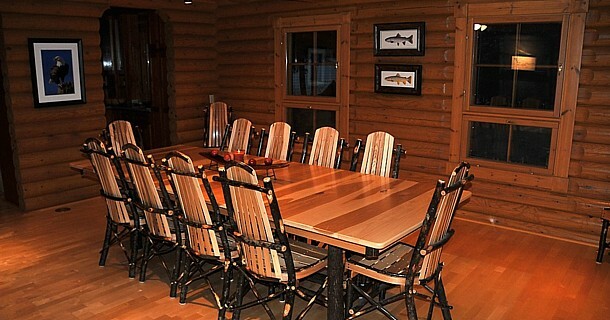 Just kick back and enjoy the rest of your trip with a nice warm Lodge to heat the fishing talk up to a warm level! Just a quick update: After a brutally tough steelhead run so far things are fianlly changing!-THANK GOD!. I have never seen a start to the spring run so slow and dismal in 23 years because of the epic all-time record breaking crazy fall/winter weather that has plumeted river temps for 6 months. 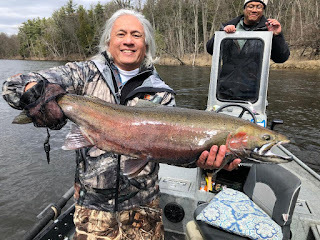 The White River north of us just got a massive run of steelhead last two days, and they are now knocking on our door on the Muskegon as we speak as water temps are finally hitting 38 F-that is still low for April but we have had ice cold run-off for three weeks now, So if your outing is just coming up- you are in big luck! The good news is the rest of April, May and even early June will be full of steelhead as each day it only gets better- Black buggers/leeches and more black stones are the colors, Salmon fry have not hatched yet which is really odd - climate change ( which I talk so much about in my NEXUS book is a real game changer now so we better get used to it and learn to adjust and think with science not just with our calendars. 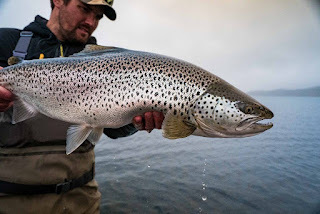 Also note the Muskegon from Croton Dam to Lake Michigan is a TYPE III regulation- all brown trout must be 15 inches or larger to be harvested -FYI- that will be a trophy brown trout game changer for sure! 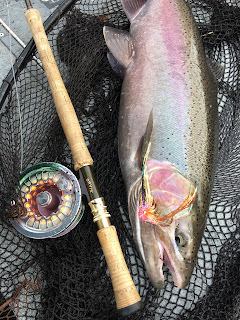 ( bait bucket brigaders can still keep 10 inch rainbows for the pan- leave the browns for a trophy fishery eh!- and please release your steelhead. I think 2019 will give the "one and done" steelhead limit a much needed boost , since we were inches close to getting it passed two years ago. Eat suckers or river rainbows- suckers actually aren't bad tasting from cold water ( my dad and I ate them from small trout streams in the spring when I was a kid) sort of like monk fish/ catfish tasting 😋, Panko crust them or bake and put my dijon/dill beurre blanc sauce on them and "delish! "...good luck this spring! 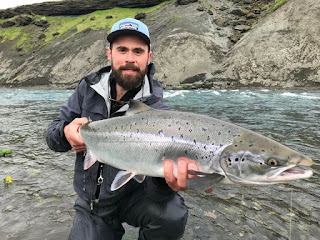 COME JOIN US FOR AN AMAZING WEEK IN EARLY SEPTEMBER IN THE MAGNIFICANT NATURAL BEAUTY “WONDERLAND OF FIRE AND ICE”- THE ULTIMATE ATLANTIC SALMON AND BROWN TROUT NEXUS UTOPIA! AN EPIC TRIP OF A LIFETIME TO FISH ON ONE OF THE MOST BEAUTIFUL RIVERS IN ICELAND- THE STORA LAXA ,IN A PRISTINE ATLANTIC SALMON/BROWN TROUT PARADISE ! DATES: SEPTEMBER 4TH- 9TH, 2019. 5 NIGHTS/ 4 DAYS FLY FISHING FOR ATLANTIC SALMON AND BROWN TROUT- GOURMET FOOD/NATURAL SCENIC TOURING /RUSTIC REMOTE LODGING /HOT SPRING MINERAL BATHS AND THE FISH OF DREAMS! 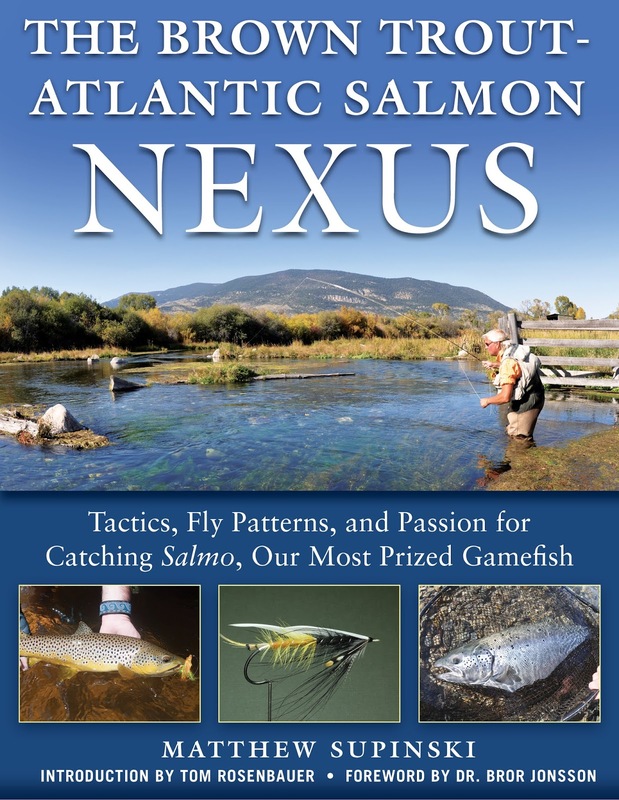 If you’ve read my books “Selectivity-Trout/Salmon/Steelhead” and the newly released “Nexus”, you will have read and seen in images how much I have raved about Iceland and its Salmo Brown trout/Atlantic salmon magnificence! The trip includes guiding/lodging/gourmet dining at these magnificent big salmon and brown trout waters where you will absorb a wild wilderness experience on this stunning river. The Stora Laxa is an absolute gin-clear river where its vistas are spectacular. 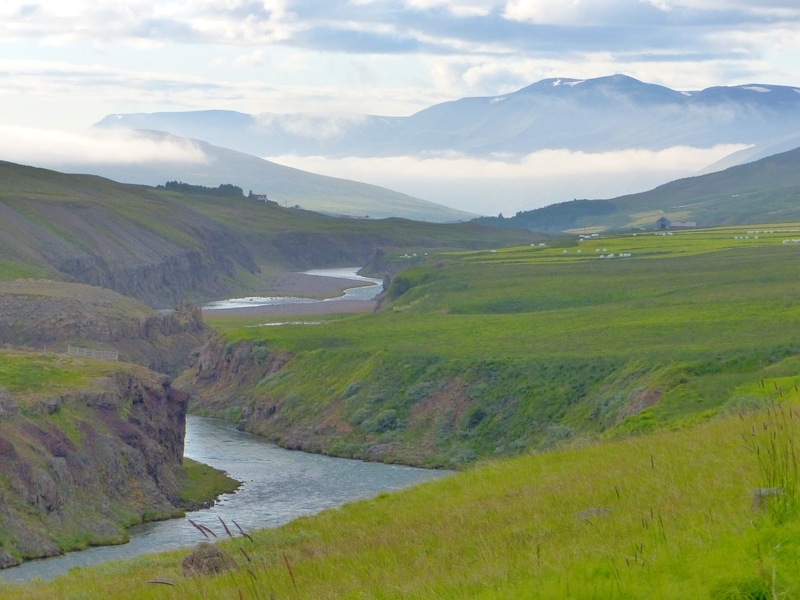 The landscape of the river is stunning where the river has dug its way deep into several million years of bedrock offering amazing scenic views. In early September there are massive numbers of “BIG” multi-sea salmon in the river at that time. The ability to take both Atlantic salmon and brown trout nearby on small surface dries and swung flies/riffle-hitched tubes is a thrilling reality. Hope you can join us on this “bucket list” fish of a lifetime trip! 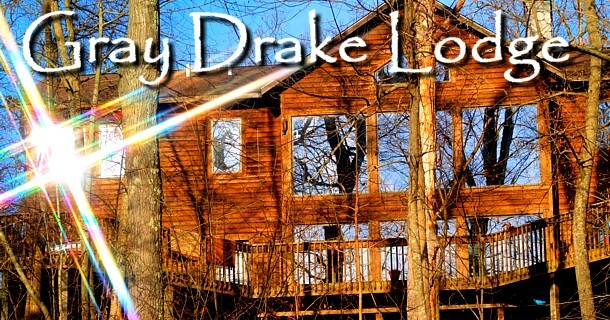 Contact Matt Supinski at the Gray Drake Lodge for pricing/information etc. We are looking forward to discussing this great opportunity trip of a lifetime. 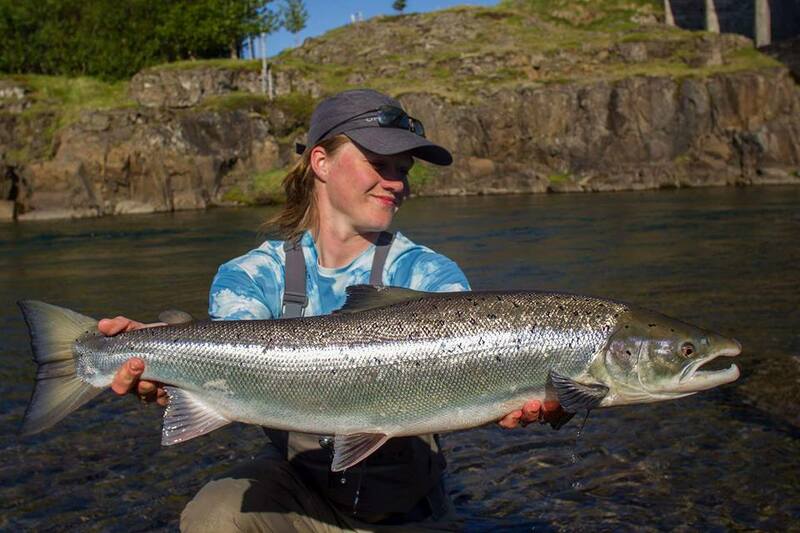 It is a great destination for couples/significant others who don’t fish since Iceland is such a world-class natural scenic wonderland. SPRING IS HERE! 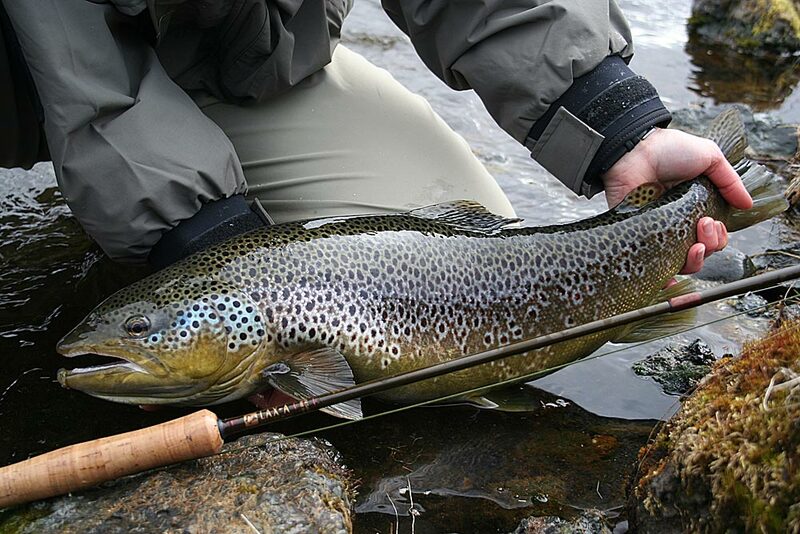 WANT A TROPHY LEVIATHAN 20 PLUS BROWN ON THE DRY FLY? I WILL BE DOING MY PERSONALIZED GRAY DRAKE HATCH MATCHING CLASSES AGAIN THIS YEAR FOR INDIVIDUALS AND SMALL GROUPS. IN-DEPTH HATCH MATCHING TACTICS/FLIES ETC. AND STALKING GIANT TROPHY GULPING BROWNS. 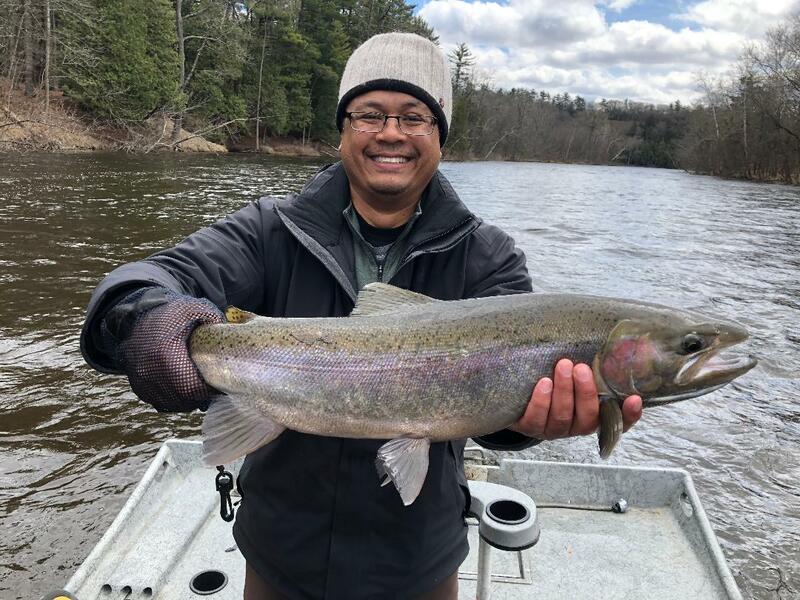 WITH OUR NEW TYPE III TROPHY BROWN REGS STARTING APRIL 1, THE MUSKEGON'S BROWNS ARE JUST GOING TO GET BIGGER AND MORE OF THEM! 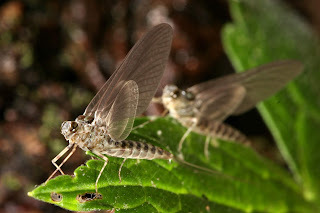 I TARGET THE MORNING AND EVENING SPINNER FALLS, AND FISH SUNKEN PATTERNS AND WIGGLE NYMPHS BY DAY- UNEXPLORED TERRITORY FOR BIG MAYFLY HATCHES. I AM DOING INDIVIDUALS, DUOS, SMALL GROUPS, YOUNG ANGLERS/PARENTS JUST STARTING AND TEACHING THEM THE INTRICATE DETAILS OF THE EVENING AND MORNING GRAY DRAKE HATCH PROGRESSION. 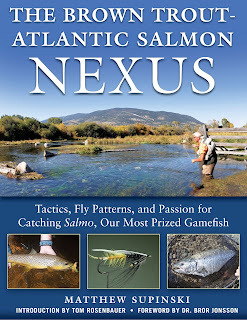 WITH NEXUS BOOK INSPIRED FLY PATTERNS AND NEW INSIGHTS HOW BIG TROPHY BROWNS FEED TO THIS HATCH AND TO SULPHERS, ISONYCHIAS, CADDIS ETC. MY PASSION FOR MAYFLIES AND BROWN TROUT IS WHAT STARTED THE GRAY DRAKE !